How to Open the Application Manifest file for Windows Phone 8 in XML Editor? The Windows Phone project includes the WMAppManifest.xml, a XML file that contains the important Windows Phone app related information like the Capabilities that the application needs, Display Name, Supported resolutions, tile images, hardware requirements etc. 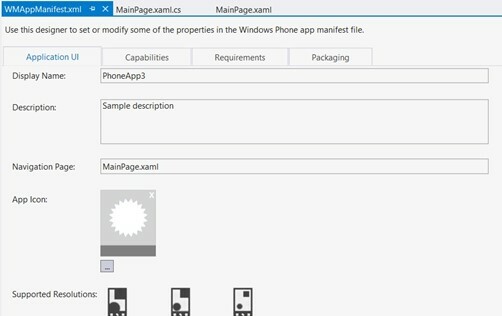 The Windows Phone 7.5 SDK opens the Manifest file in the XML editor where the user can edit the WMAppManifest.xml to include the app related properties. The Windows Phone 8 SDK now provides a cool Graphical Manifest Designer that lets the developers to edit the WMAppManifest.xml via GUI (Graphical User Interface). This Graphical Manifest Designer is directly integrated in the Visual Studio 2012 and makes it very easy for the developer to modify the file without touching the raw XML file.